The Allergy & Asthma Center, P.C. David Mangold, PA-C & Aggie Danielwicz, PA-C, Ph.D. The Allergy & Asthma Center now just has an office in Kalispell, MT. If you are looking for information on the Missoula office, please click here to be redirected. 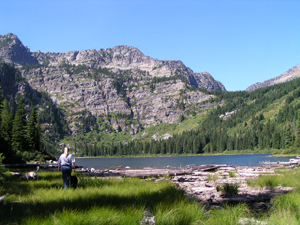 Western Montana is a beautiful place to live, work, and play. However, we have plenty of nature to contend with. For people with allergies and asthma different seasons can mean different symptoms, medical visits, and multiple medications. At The Allergy & Asthma Center, P.C. we are committed to restoring your quality of life and working with your needs and desires to make your symptoms manageable. We also treat a variety of non-seasonal disorders to give you control over your life. Some examples are: food allergies, insect allergies, and eczema. Please click on Services for a summary of diseases that we treat. We participate with most private insurance companies and we are sensitive to patients without health insurance. We treat Medicare patients and children with Medicaid. Please click on Insurance & Billing to see which insurance companies we participate with. We offer flexible hours and sometimes make house calls! Call us toll free at 406-300-4882 for an appointment today to see if we can help you.